Former Trinidad and Tobago World Youth Cup player Marcus Joseph scored his second hattrick in just four days for Point Fortin Civic yesterday as the southern based team whipped St Ann’s Rangers 3-0 at the Marvin Lee Stadium in Macoya to rocket up the standings. 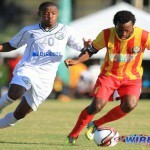 Photo: Point Fortin Civic playmaker Marcus Joseph. 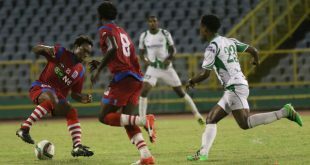 The 22-year-old Joseph, who won five caps from the “Soca Warriors” in 2013, has underwhelmed on his return to the Pro League with Point Fortin and the attacking midfielder had not managed a solitary League item before Saturday’s 5-0 mauling of Police FC. 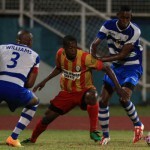 And the attacker with a cannon for a left boot produced a remarkable encore yesterday by managing the rare feat of hattricks in two successive matches as Point Fortin climbed from eighth to third in less than a week. 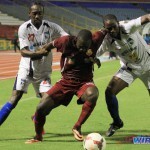 It was business as usual for leading club, DIRECTV W Connection, as the “Savonetta Boys” whipped San Juan Jabloteh 4-1 in Macoya to extend their lead over second placed North East Stars to an eye-opening 12 points. The Stars team has one game in hand. Shahdon Winchester, who spent the first half of the season on loan in the Finland Premier League, grabbed a double for his first Pro League goals of the season while defender Joel Leslie Russell and playmaker Joevin Jones chipped in with a goal apiece. At the Ato Boldon Stadium in Couva, Caledonia AIA’s artists slipped to fourth place after a third draw from their last five fixtures. Caledonia was held 1-1 by Police FC, who climbed two places to fifth with the result. 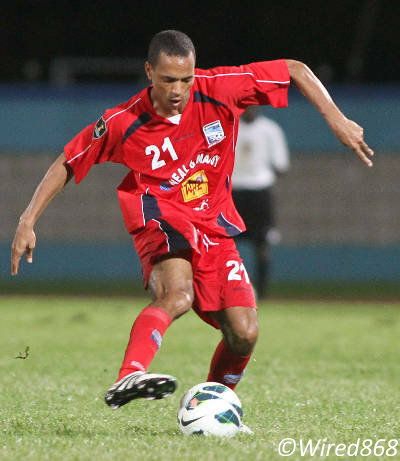 Photo: Veteran Caledonia AIA playmaker Densill Theobald scored his third League goal of the season against Police. Pro League action continues with a Hasely Crawford Stadium double header on Friday evening with Jabloteh tackling Police from 6 pm while Connection meets Stars from 8 pm. 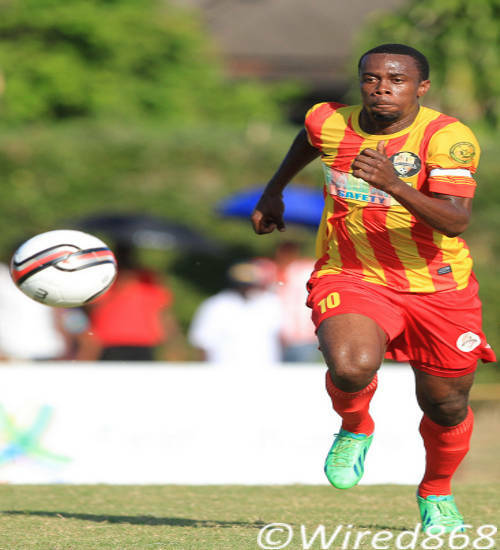 Sixth placed Central FC, who recently signed Guaya United midfielder Leston Paul and overseas-based defender Yohance Marshall, travels to the Mahaica Oval on Saturday where the “Couva Sharks” will face Point Fortin from 3.30 pm. 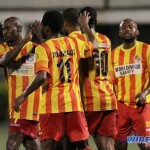 Point Fortin Civic vs Central FC, 3.30 pm, Mahaica Oval.